Have you tried a twisted frosty yet? They've been out for over a year and a half now. For me, I don't think I've had one since last June. So I spent a good two hours recycling all the computer junk in my new office. If you've ever wondered what to do with old computer hardware, take it to Staples. Usually it costs $10 a item (computer, monitor, printer), but they are running a special right now so printers are free to recycle. It's not easy fitting 13 pieces of junk in a sedan, but I made it happen. 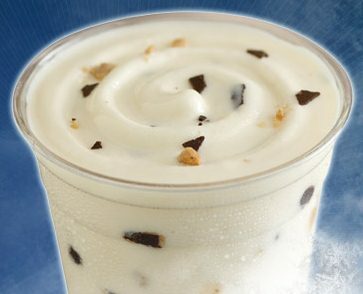 Anyway, I figured my hard work was worthy of a chilly treat, so I decided to finally try the Nestle Toll House Cookie Dough Twisted Frosty and I wasn't disappointed (except maybe a little by the blending job). I just wasn't in the mood for a chocolate base, guess I felt like being traditional today. As you might expect, you get some cookie dough bits (which stay as bits since the faux blender can't really hurt them), but then you get a very generous supply of very thin chocolate slices. It's these slices that really make the frosty enjoyable, otherwise, it would be terribly boring. So, Wendy's may not have the variety of a DQ, but the few choices they do have usually hit the spot when you are in the mood (or can't make it to DQ). Give them a chance if you haven't. Happy St. Patrick's day by the way!